A true 2018 flagship contender? 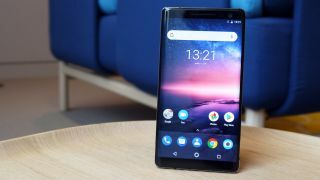 The Nokia 8 Sirocco has the looks and the price tag, but it doesn't quite deliver a 2018 flagship experience, but there could be a new hero handset on its way. That's according to Twitter leaker Roland Quandt, who has a reasonable track record of revealing smartphone details ahead of time, as he has tweeted a teaser about a potentially new, high-end Nokia. Quandt teases a 'high-end SoC' for the handset, which could well mean this new Nokia flagship may sport the Snapdragon 845 - a chip that the 8 Sirocco really should have had, instead of the older 835. More interestingly though, he also mentions that the phone will boast a technology being pioneered by Chinese brands. That immediately makes us think of the recently announced Vivo Nex and Oppo Find X, both of which ditch the notch, offer all-screen designs and pop up cameras. It means we could see a high screen-to-body ratio on the rumored phone, as a pop-up camera seems less likely at this time. That's all the detail we have for now, but Quandt says he'll have more for us today, and we'll update this article with any additional information he may have on the subject. We've also contacted HMD Global to find out if we can get any more information from the company directly.